More often than not, the place you need to put your ladder is uneven — most of the outdoors just isn’t as flat and even as a parking lot. Some ladders have adjustable feet, but often you have to cope with a shaky situation any way you can. The BaseMate ladder stabilizer provides a solid platform for most aluminum, fiberglass, and wood extension ladders. It’s a hardened steel arch with two “Easy Connect” arms that clamp to the bottom rung of the ladder whether it’s 12″ or 44″ wide. It’ll support up to 1,200 lbs. and is weight-tested to type 1A USA and Grade 1 CDN ladder requirements. Once the BaseMate is attached to your ladder, tap on the release lever of the “triple-action” locking system with your foot and the arch can slide to plumb the ladder on an uneven surface. 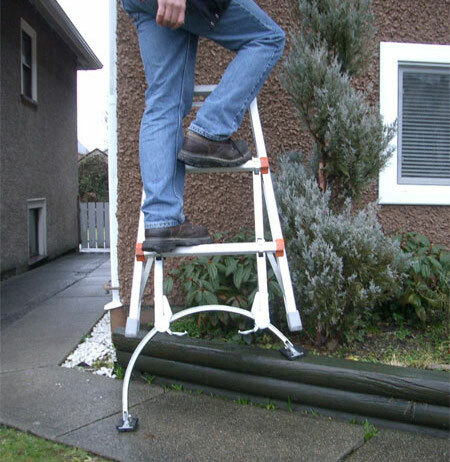 The non-slip, adjustable rubber feet keep the ladder in place. The BaseMate will only add about 7 lbs. to the weight of your ladder. Pricing starts around $140 before shipping. You had me until the “$140 before shipping.” part. I’ve seen a couple iterations of this idea. One was similar but had a wider base (arc) giving the ladder a nice broad footprint. Another was simply extensions that could be added directly to the legs allowing them to be individually lengthened in small increments. I agree that $140 is way too much for this model unless it is precisely what you need. For that price I can buy an articulating ladder with more uses. Love the idea but the price is too high for me. A search for “ladder leveler” on Amazon.com brings up several less expensive competitors that are highly rated. Am I the only one that thinks standing a ladder on a stack of PT rounds is a bad idea? Yeah, good point Bob, and wet slippery ties too! I have no personal experience with them but a coworker of mine has one and loves it to no end and while the footing in the photo is questionable, it does show how those legs can move. Is the $140 the gold or platinum edition? Do they make an aluminum version for say $35, what it is worth?